This topic contains 3 replies, has 2 voices, and was last updated by Michael 2 years, 2 months ago. 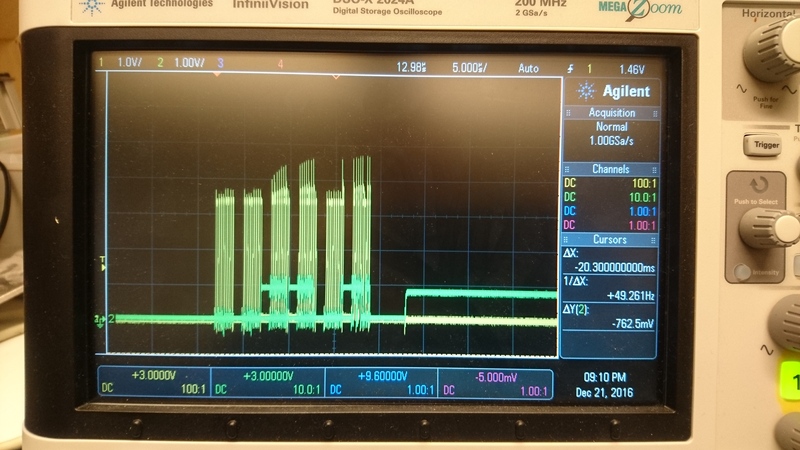 On my UM7 sensor the MISO signal only reach up to about 1 volt when communicating with a Arduino Due, see figure. The Arduino Due operates at 3.3 voltage. Slave select, MOSI and Clock looks good. I have connected the UM7 to an Arduino MEGA as well but with same result. Have any of you encounter the same problem? Does any of you have any idea what it is that causes this? The yellow is the clock and the green is MISO. Sorry for my retardness regarding the picture. Here’s a second attempt. Looks like a fried pin on either the UM7 or your hardware. can you test the UM7 not connected to anything?